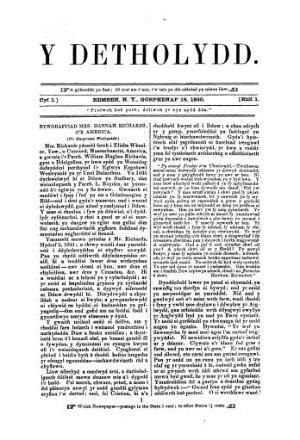 A monthly Welsh language periodical that published articles from the Welsh periodical press for the Welsh-American community. The periodical's main contents were religious articles, biographies, poetry and news. The periodical was edited by the minister and printer, Robert Everett (1791-1875). Associated titles: Y Cenhadwr Americanaidd (1852).